A lovely shot of the stable yard with two of the horses and their handlers. They were used to pull the wagons loaded with ironstone from the mine. If their usual handler wasn’t there these horses could be very awkward to any other man trying to work with them. 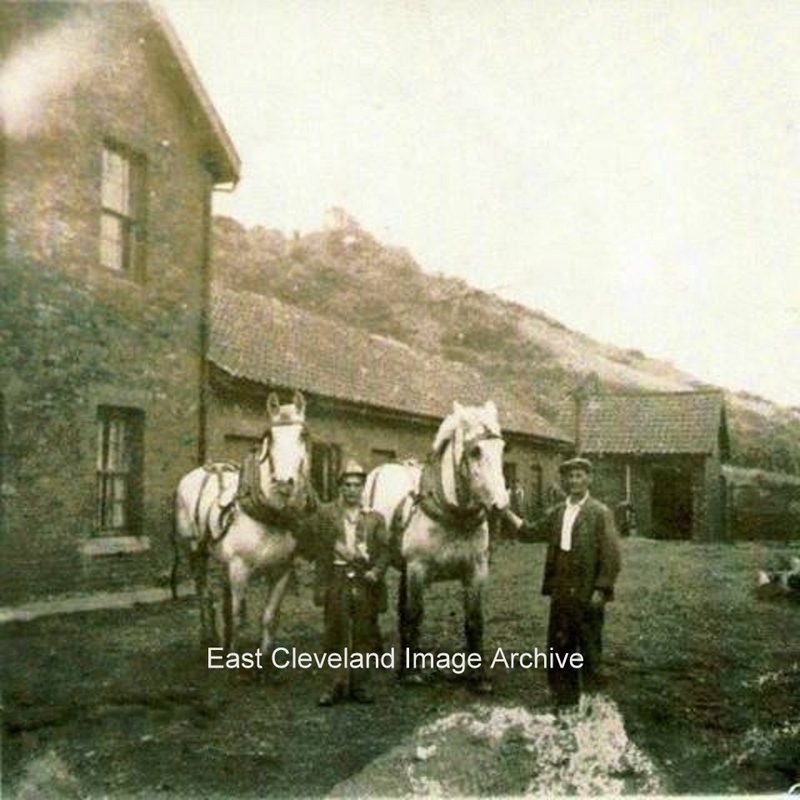 Although there were stables underground, the horses were brought out on a regular basis to enjoy time in the field belonging to the mine. A Cummings tells us: ”The building to the left was the foreman’s house, the building with the open door was the wash down room where the horses were bathed, and the hill in the background is the bankside up to Carlin How, where the railway ran.The stables are between the house and the washroom. My father sometimes looked after the horses and I often had a little sit on them.” Colin Hart advises the Archive: ” The two men in the photograph are Leslie (Pem) Holliday and Albert Wilson”. Image courtesy of the Pem Holliday Collection and Cleveland Ironstone Mine; also thanks to A. Cummings and Colin Hart for the updates. The two men in the photograph are Leslie (Pem) Holliday and Albert Wilson. Please can someone confirm that these stables are to ones that have Horse Muck terrace as its main road. My auntie Ada Kennedy lived in Skinningrove just down the road. As a kid, I found a £5 Note (one of the White paper) type on that road.